To date, truck mount steam cleaning in Sammamish, WA is probably the best cleaning solution for carpeting. 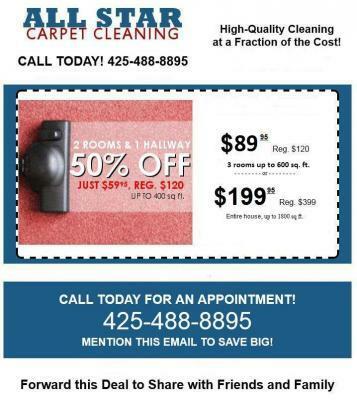 Your carpets will be thoroughly and powerfully cleaned. All grim and dirt will be removed and your carpets will dry in a faster amount of time due to the high water pressure and hot heat used. High water pressure in combination with a strong vacuuming suction and hot heat deep will effectively remove surface dirt as well as dirt and debris that are hidden beneath your carpet fibers. If you hire us, you will find that your carpeting will be spotless and will smell fresh. To protect your carpeting and to extend its life, it is recommended that you have it professionally cleaned no less than once a year. Doing so will help your carpeting look like new for years. Truck mount steam cleaning suctioning power offers more power than other cleaning methods. In addition, the level of water pressure is unmatched, which makes it the most effective way to clean your carpets. Our skilled technicians are well-trained and have the know-how to clean your carpeting in a fast amount of time. You will be walking on clean and dry carpeting in a few hours as compared to 6 hours or more hours if you were to rent a machine and try to clean your capering on your own. Another great benefit is less mess in your home. When the job is completed, nothing will be left behind. There will not be any messy buckets to empty, which helps make the cleanup time fast. The only equipment that we will carry into your home is the extended hose that is connected to our truck. If your carpeting is in need of a thorough cleaning, contact our well-established and experienced truck mount steam cleaning Sammamish, WA company today and make an appointment.